Mrs. Pondero says, “There are no free puppies!” Which means, of course, that they are only free until they get home. Then those little buggers get quite expensive, what with all that vet stuff, food, gear, training, and other special needs. They all have special needs. 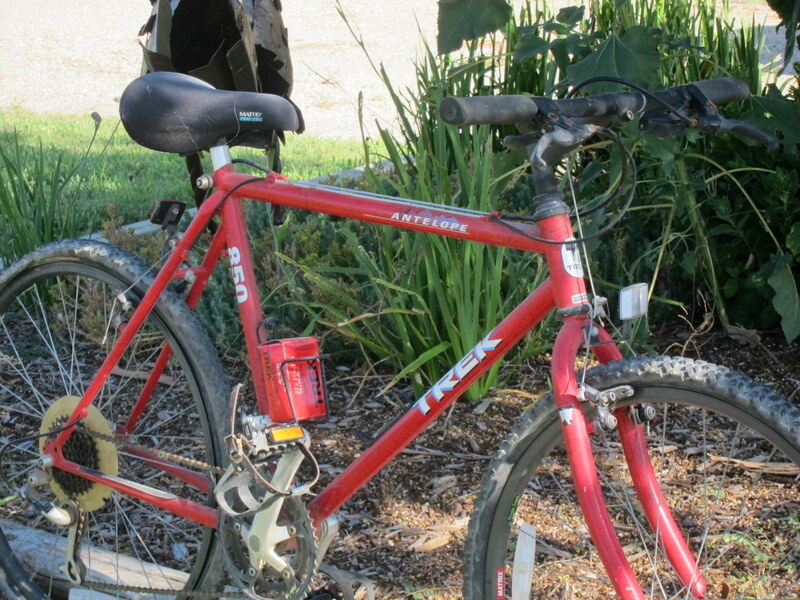 Based on limited research, it appears to be a 1991 Trek 850 Antelope. I don’t think it was bottom-of-the-line, but it doesn’t appear to be anything special. 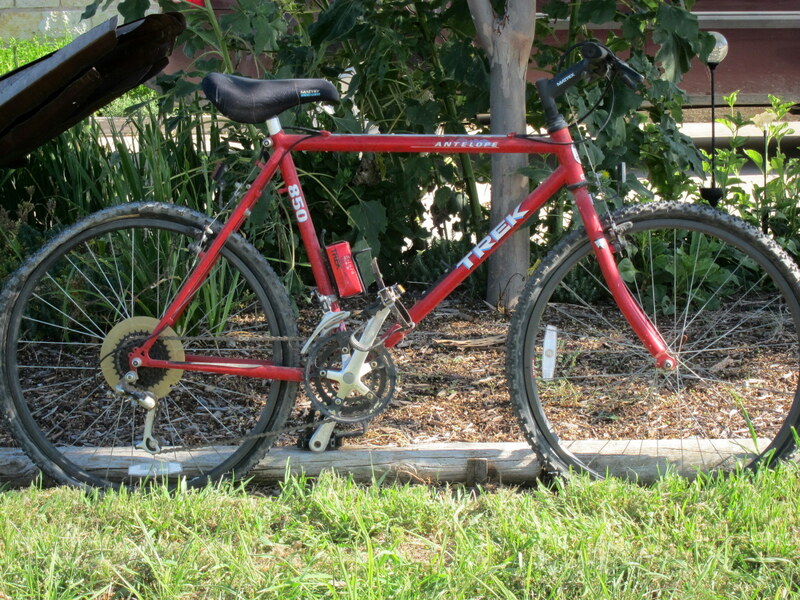 The only reason I said yes is that I’ve been thinking about a old, cheap rigid frame MTB that I could play with and haven’t been able to pull the trigger…something with knobby tires…it would be kinda fun to have project bike..and, hey, I’ve got a parts bin that might allow me to get this thing running for free. Maybe this stray needs a home, but honestly, I’m not sure I want to take this on. So I’m going to walk around and stare at it awhile to see if I can ponder a potential (cheap) project in there somewhere. If not, maybe it’ll be a donation. What I really need, is a visit from Jon Grinder. I have seen him take uncountable numbers of forlorn strays and turn them into fun, useful, interesting, and attractive bicycles. He has vision, creativity, and mechanical skills. He has the ability to see potential in a bicycle. I’ll bet if I were to describe what I wanted this bike to do, and turned him loose in my garage, he could walk out with a pretty play toy in one afternoon. So Jon, if you are out there, what do you say? Play with it, or find it another home? As a matter of fact, I’d appreciate input from anyone interested enough to toss me some ideas. Project concepts…or someone else’s headache. Is there a logical way to make an intelligent decision on this? Let me narrow the field slightly. It’s either a donation or a knobby tire MTB to ride in the yard or on the local (easy) trails kind of bike. I might try to recall my once impressive wheelie skills, but I don’t plan to take it over any sweet jumps. Who knows? Maybe I’ll get some free studded tires and ride it on the acreage ice during the winter? I think the Antelope was supposed to be an ok bike, maybe entry level, but not horrible. I say use it as a mtb beater, or throw a big ol’ basket on the front! Can you convert her to single-speed? That sounds to me like a lot of fun on local/easy trails. My experience with (almost free bikes, picked up in pawn shops) has been mostly good. One (out of six or seven) was a disaster. So, batting in the upper 800’s. Could be fun! Thanks, guys, for the thoughts so far. I have a soft spot for old mountains bikes. 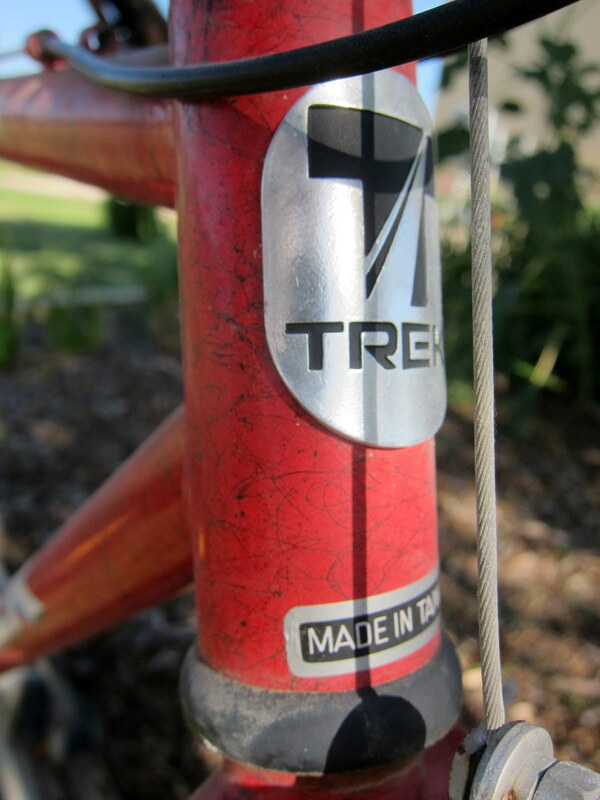 I own a Trek Antelope (older, 1985) so I’m unable to give an unbiased opinion. However, those old frames are pretty bomb proof. It can be whatever you want it to be. 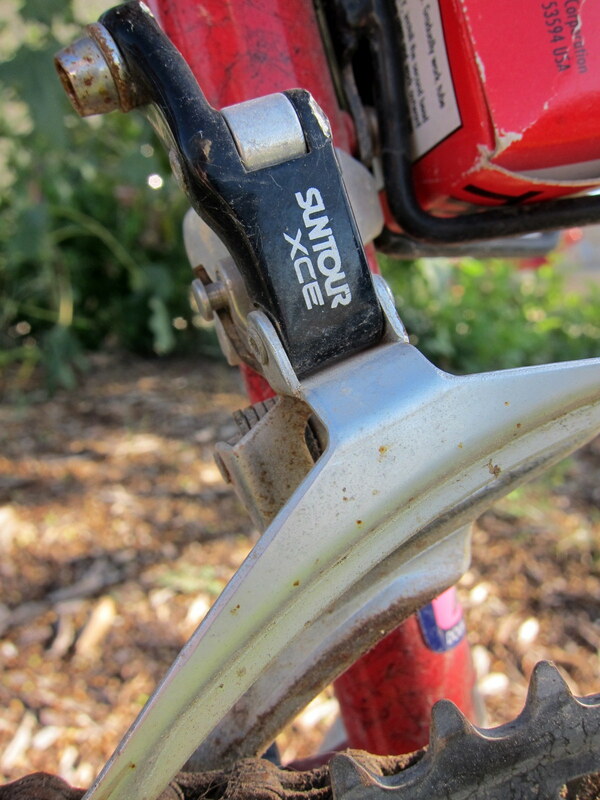 I would lean toward the singlespeed version, myself, simply because those shifters are so bad! 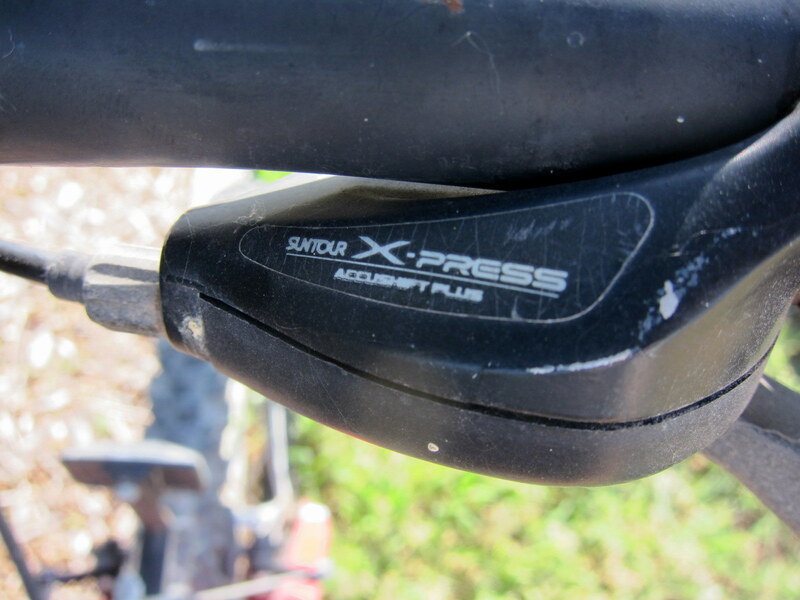 An interesting alternative, since you have to run a chain tensioner, anyway, is a 3-speed (triple crank, single cog). 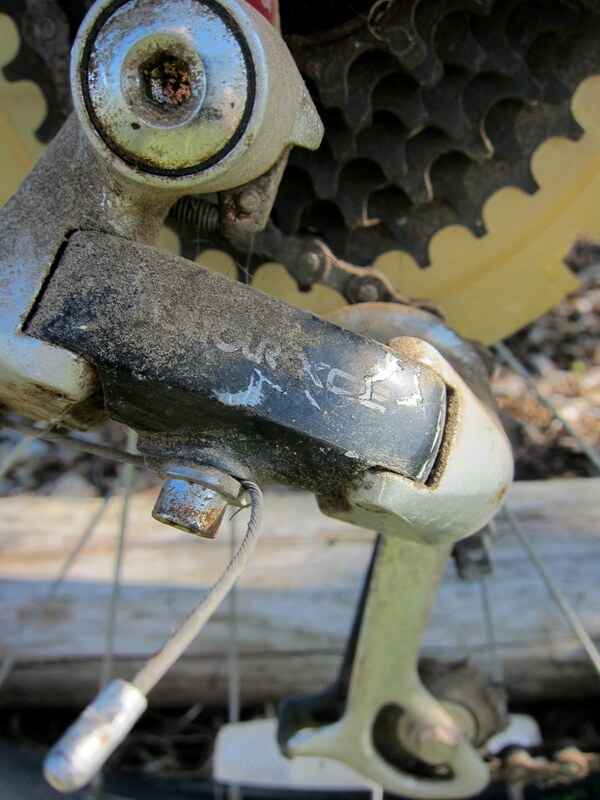 I once rode the Slickrock Trail on a front-threespeed, as I call them, just to prove that I could. Thanks, Jon, I knew you’d have a creative idea. I’ve actually thought about a front 2 or 3 speed before, but never seriously. But I might do that now. First, I guess, there’s some cleaning up to do. First off does the bike fit you? If it does get those tires fixed /replaced to see if you like the way it feels. How extensive is your parts bin? Also give it a bath, this will help you get up close and see all the bits and pieces, Nope there is no such thing as a free fixer up bike. I like this suggestion to try it out before I get ahead of myself. Perhaps make it your grocery bike, with a trailer attached? I’ve been contemplating a 26″ single speed country bike for years now. That appears to be a small frame suitable for a shorter person. however the specs indicate a solid cromo frame, probably 6 /1/2 lbs stripped for fork and frame. Ample room for whatever tires you wish and lots of braze ons for racks etc. 1×7 would be very easy and lighten it up a bit. perhaps North Roads or moustache bars. I set up something similar as a one speed for my nephew by getting rid of all the cogs except one on the rear wheel and using one chainring and an old derailleur for a tensioner. Really a nice ride for someone who wants to just hop and ride with no adjustments or fiddling around. Did spring for $4 for a single speed cog to go on the hub and replaced the seat and tires from stuff I had laying about. Performance Bikes sells some very cheap 26″ inch slicks with Kevlar that make the bike seem almost nimble. Other than a little time and repacking all the bearings and giving the wheels a little TLC truing, little cost and effort from to me. I love it! I had an 1990 Antelope for years. It was my Xtracycle for a while and then just a fun beater bike and loaner MTB. I doubt you would regret keeping it. In fact, I sometimes miss mine. I got rid of it because I had an extra LHT frame. But the functionality of that old bike isn’t much difference than the nicer LHT. It sounds like no one believes that this stray would be a waste of at least some attention and consideration. I used an antelope for years as a commuter. It was even the first frame I put my xtracycle on. I think you should do something fun to it, but because it’s different than building up a frame that you bought. You can try a departure from the way you have built in the past and if it all goes wrong, who cares?! Nothing lost. Want a fun challenge? A retro-direct drive! I’m sure it’s possible even with vertical dropouts. Not exactly. I have a vague idea of taking it to my office and using it as a city run-a-bout bike. I might have a few better bits that I could use in place of the stock bits. Maybe add a front rack and basket…and some more upright bars. That means no knobbies (bummer), but probably means it would be used more. These tires are what I use on my 26″-wheeled town bikes. Still capable for off-road, but nice around town, as well. These look pretty good, and I’m going to give them serious consideration. That’s a cool bike, and I like those bars. Great use and evolution of a trusty old steed. I especially like the Mega-Range cassette! I never would have offered this as a “free puppy” to a good home. You see, I know your wife, and I know she knows what that really means. “Bee Keeping friend” here! I had heard this bike had become famous, and decided to check it out for myself. From reading the comments, it seems like the bike community is just as interested in second, and third chances as the dog community. And, if truth be told, the bee community is not far off. We are always trying to give them the benefit of the doubt, and every opportunity to go forth and prosper. You saved it! I know you’ll make the right decisions for its future. I hope it gives you more than you put into it. Really. I do. I say this in all seriousness. My last “free puppy” cost me $7000.00 and 2 years of serious rehabilitation commitment. I don’t have regrets, but the next “free puppy” will get a much closer evaluation before they are allowed in. I look forward to following this project. Thanks (I think) for the project, Candi!